The Friday Forum (FF) has called upon all officials and candidates involved with the upcoming Presidential election process to protect and uphold the franchise pointing out it is not just a fundamental right but part of the very sovereignty of the people. In a media statement issued in light of the critical days ahead due to the upcoming polls, the group has called upon the Elections Commissioner, officials of the Elections Department and all public officers concerned with the conduct of the election to implement election laws independently and impartially and to ensure the conduct of the polls are done with integrity and honesty. The organization has also urged the IGP and the Police department to not be deterred by political interference in implementing their duties and particularly ensuring elections laws are upheld, pointing out that they need to ensure that their role would not be called into question unlike during previous polls. FF members Jayantha Dhanapala, Saliya Pieris and Shanthi Dias on behalf of all members of the organization has also asked the all candidates contesting at the upcoming elections including the incumbent President to ensure election laws are respected and refrain from misusing state property during the campaign. The group has also called upon media institutions to ensure a balanced coverage at the polls as well as members of the public, civil society and grassroots leaders to be vigilant and ensure that preservation of the role of law and to be proactive in combating violations of electoral law. The Presidential Election of 8 January 2015 is significant not only because it is the first time an incumbent President is seeking office for a third term, but also because it is the first Presidential Election conducted after the Eighteenth Amendment to the Constitution. Keeping in mind that franchise is not only a fundamental right but part of the very sovereignty of the people, the Friday Forum calls upon the following to protect that right. The Commissioner of Elections, officials of the Elections Department and all public officers concerned with the conduct of the election are urged to implement the election laws independently and impartially, and to take necessary action to prevent violations of the law especially the Constitution and the Presidential Elections Act. We call upon all of them to ensure that the conduct of the election, the counting process and the declaration of results are done with integrity and honesty, in a manner that the results and impartiality would not be called into question. The role of the Police has been called into question at many elections. The Eighteenth Amendment to the Constitution has dealt a severe blow to the credibility and independence of the police. There has been a perception that the appointment of the present Secretary to the Ministry of Law and Order has been effected to ensure the pliability of the police at election time. We urge the Inspector General of Police and the police not to be deterred by political interference in carrying out their duty to the people, especially in carrying out election laws pertaining to the display of cut-outs and posters and bringing miscreants to book irrespective of political affiliations. We call upon the President, the Common Opposition Candidate and all other candidates at the election to comply with the law and to urge their supporters and agents likewise. We strongly condemn the misuse of state property during the campaign and the use of any authority to commit corrupt acts tantamount to bribery or treating. We call upon the candidates to publicly declare their Programmes of Action and commitments, with target dates, and to release their Declaration of Assets and Liabilities. Above all, we stress the need for the contestants and political parties to ensure that harmony and co-existence amongst ethnic and religious groups are not imperiled in the election campaign. We urge them and their supporters to refrain from making unacceptably vituperative statements. We urge the Sri Lanka Rupavahini Corporation, Independent Television Network (ITN), the Lake House Group of Newspapers and the private media to ensure that a balanced coverage is given to all parties at the election, that election coverage is done in an objective manner, and to refrain from giving publicity to defamatory and vituperative statements. The State Media should not be abused in favour of the candidate of the ruling party. We call upon the people, including civil society and grass-root leaders, to be mindful that the present election is perhaps the most crucial this nation has faced in many years, and that the public have a vital role. We call upon all segments of the public to be vigilant to ensure the preservation of the Rule of Law and to be pro-active in combating violations of the electoral law. We also urge all voters to exercise their franchise and not to refrain from voting on election day, giving due consideration as to how each candidate’s campaign was conducted, to long term interests of the nation, to ensuring a governance structure that combats corrupt practices and upholds democracy, Rule of Law, human rights, equity, justice, media freedom, tolerance and harmony in our pluralist society. This policy statement of the Friday Forum is based on the priority we place on good governance, maintenance of the Rule of Law, and other civil society expectations. We call upon all parties to protect and uphold the franchise, which we the people have enjoyed for over eight decades, and in the free and responsible exercise of which lies the hope for future generations. Mr. Jayantha Dhanapala, Mr. Saliya Pieris, Ms. Shanthi Dias, Dr. G. Usvatte-Aratchi, Ms. Suriya Wickremasinghe, Rev. Dr. Jayasiri Peiris, Mr. Priyantha Gamage, Mr. Pulasthi Hewamanna, Professor Camena Guneratne, Mr. Suresh de Mel, Professor Arjuna Aluwihare, Professor Gameela Samarasinghe, Mr. Ahilan Kadirgamar, Rt. Reverend Duleep de Chickera, Professor Ranjini Obeyesekere, Dr. Radhika Coomaraswamy, Mr. Faiz-ur Rahman, Dr. Deepika Udagama, Mr. Tissa Jayatilaka, Mr. J.C. Weliamuna, Professor Gananath Obeyesekere, Dr. Selvy Thiruchandran, Dr A.C.Visvalingam, Mr. D Wijayanandana, Dr. Jayampathy Wickramaratne, Mr. Ranjit Fernando, Ms. Manouri Muttettuwegama, Mr. Danesh Casie-Chetty,Ms. 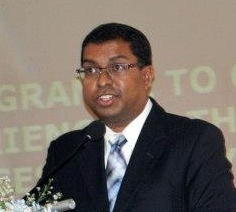 Damaris Wickremesekera, Mr. Chandra Jayaratne. Make sure All the candidates can fill paint balloons and throw them at the Medamulana MaRa cutouts. This PE is being fought out on Corruption etc.etc. A submission of a Assets Form to the EC is required and Sirisena has tendered it. Mahinda will NOT and cannot submit a true & legal Statement of it, including that of the immediate family`!! 3rd Term for overcoming terrorism alone – it was MR bounden duty! Declaration of Assets Form to EC or No Vote must be the SL slogan. Not only during the Election, but after! Rajapakses are firm believers of Stalin’s earthly reality, cynical and immoral it is. This works in this Punyaboomi where even Election Commissioners and SC Judges are now a buyable commodity. Remember that man who did the Vanishing Trick recently only to emerge later to present the nation with the “verdict” The poor chap was both wiser and richer after that – integrity being a totally different thing.